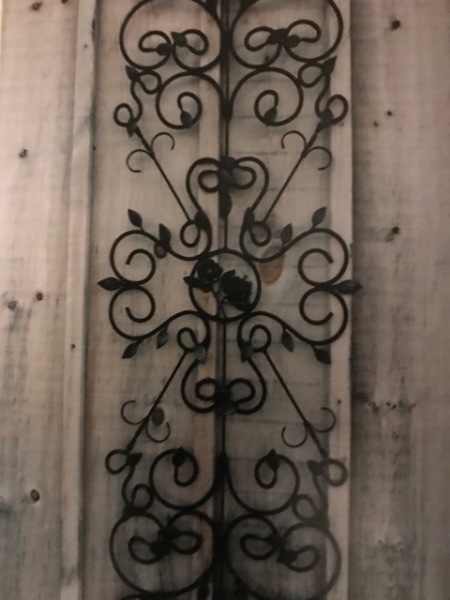 View exquisite, ornamental wrought iron furnishings. 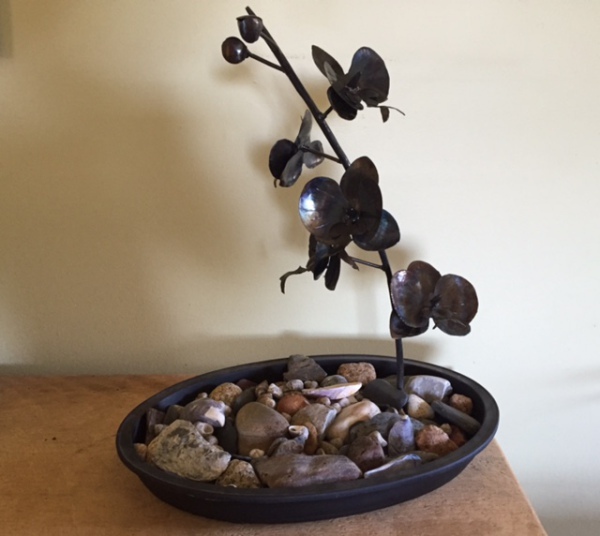 Functional art pieces custom designed and built for your home by K. John Mason Ironworks. 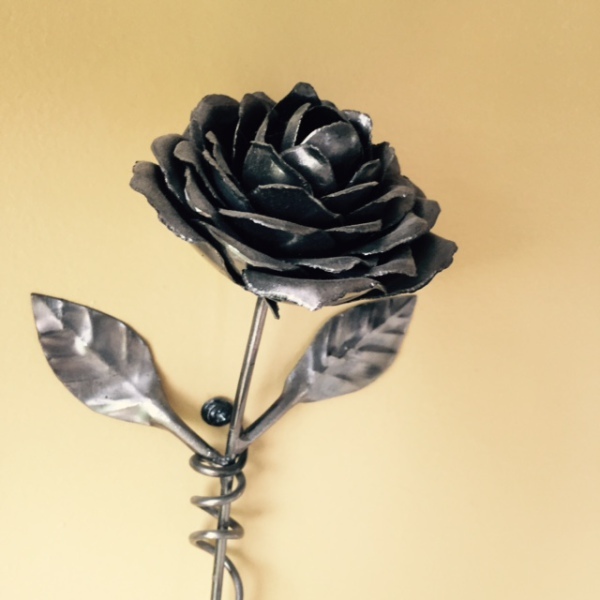 Wrought iron rose bush on hand-carved Indiana limestone base. Candle holder featuring a rock suspended within the base. Candle holders available in many styles and sizes. A delicate balance of positive and negative space. Hinges available in many styles and sizes. Celtic style back plate in a natural steel finish. 30+ year old wood slab with an Art Deco base. Coffee tables available in many styles and sizes. Ivy leaves and small birds are seen from both sides of the gates. Gates available in many styles and sizes. Beautiful on a patio. Lanterns available in all leaf styles. In a pewter finish, this mirror adds style to any foyer or powder room. Mirrors available in different styles. Can be used to hold a 4 x 6 photo. 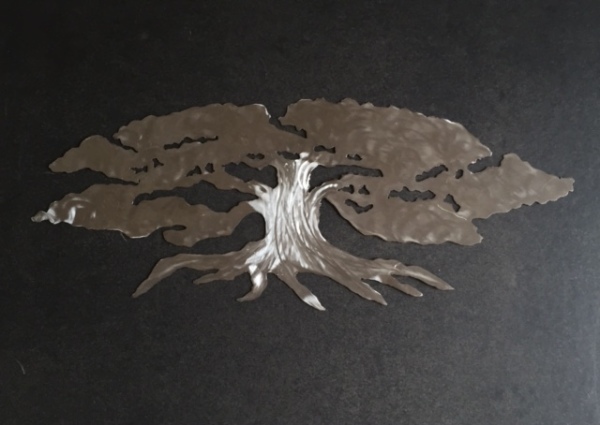 A time honored expression of blacksmiths. Pot racks available in many styles and sizes. Wrought iron garden set featuring Italian tiles and repousse lemons. Lamps available in many styles and sizes. 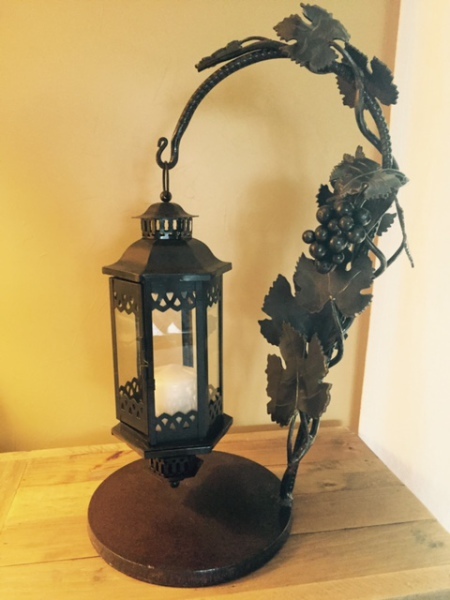 Adorned with oak leaves, acorns and birds in an antique bronze finish. Illustrating the delicacy of metal. Mirrors available with many types of embellishments. Indoor / outdoor piece in the French Country style. Available in many styles and sizes. 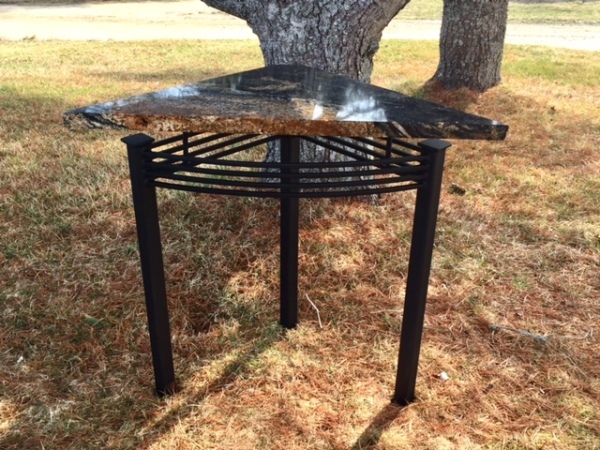 Wood and wrought iron pub table with stools. 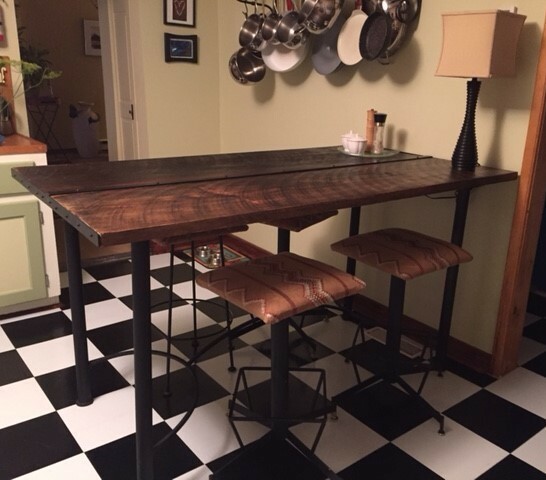 Tables and stools available in many styles. Beautiful on its own; magnificent framed! 21" ornate door hardware for a stainless steel fridge / freezer. Hardware available in many styles and sizes. Elegant on a dining room table or grand piano! Decorative hangers for all types of signage: commercial and residential. Displaying the Eye of Horus. Made to order or custom designs available. 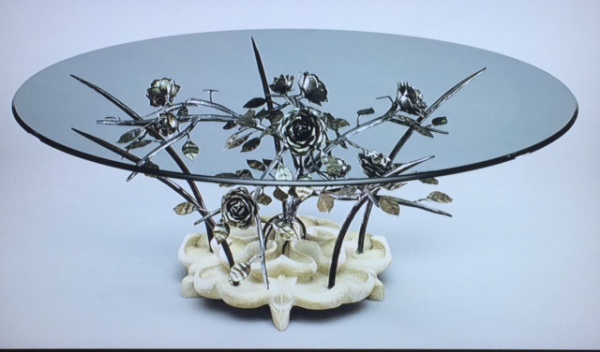 Features hand-forged rose and leaves, granite top with a raw edge and a French leg. Foyer tables available in many styles. Ideal for displaying one-of-a-kind pieces. Features French legs and a natural finish. 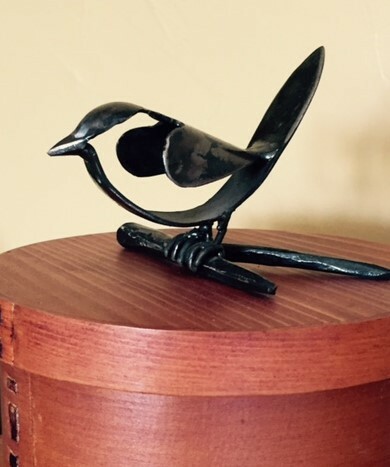 This conversation piece features hand-forged birds, acorns and a foliage of oak leaves. Constructed so that it looks like the top is floating. 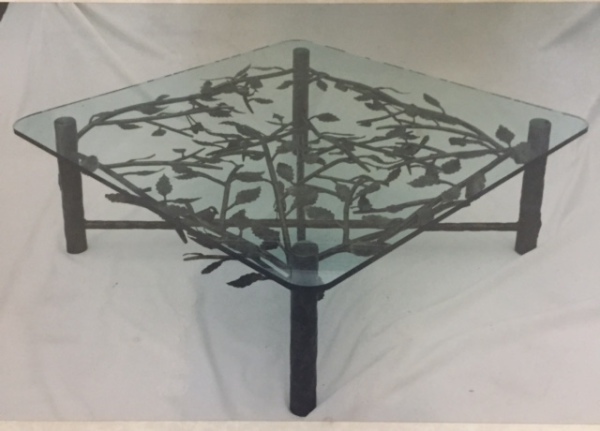 Occasional tables available in many styles. 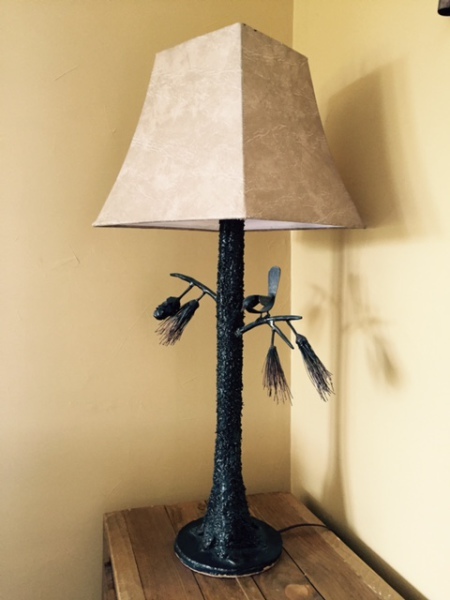 One is whimsical; a pair makes perfect bedside or sofa lamps. Available in any finish. 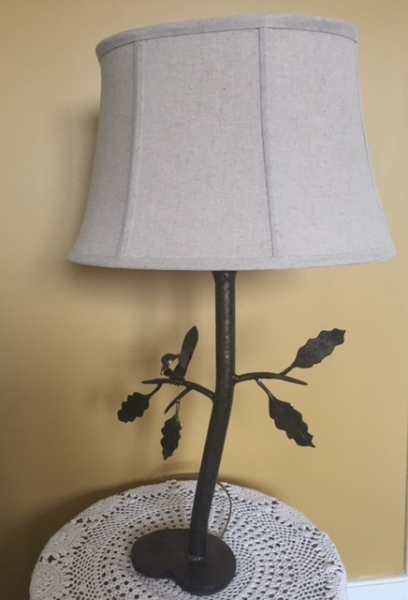 Antique lampshade sits atop a brushed steel base. LED tape provides an array of colors for any kind of mood. This Southwestern design features prickly pear cacti on a limestone base with three adjustable feet. 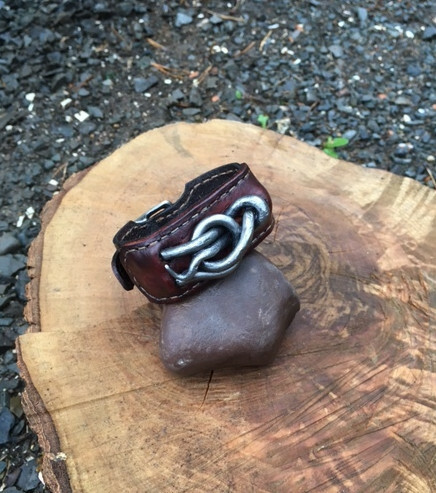 This hand-forged Bow-line knot is set in a custom leather wrist band made by master knife maker Rick Marchand. Twelve candle chandelier made from Merlot barrel staves. Perfect for verandahs. Lighting available in many different styles. A popular sight in the Carolinas, this bottle tree adds interest to any garden. Yard art available in any style imaginable. A six-headed sunflower with bee. Different kinds of flowers available. This three-dimensional tree-form railing has a textured finish mimicking bark. 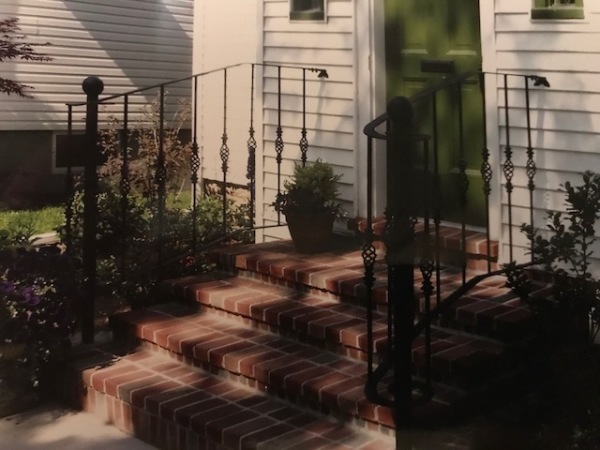 Railings available in many styles. A beautiful design for your front door. Inserts available in many styles and sizes. 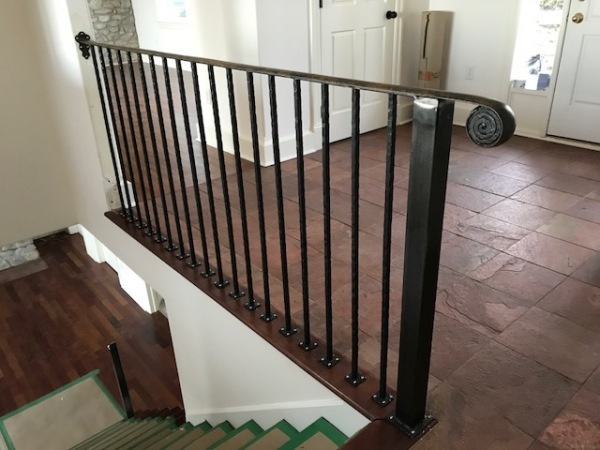 This detailed voluted railing provides two welcoming arms for your visitors. Custom built designs available. These racks are custom designed to make the bottles appear as if they are floating. 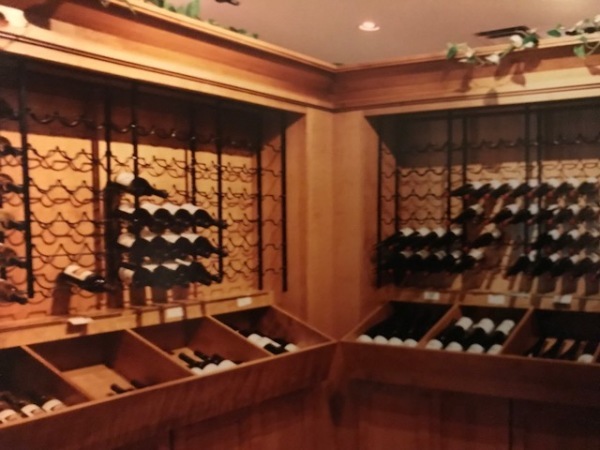 Wine racks available for any size cellar. 14' by 18' gates at the entrance of the world famous Tawse Winery in Niagara. Gates available for commercial and residential properties. Each door is held up by decorative hinges with a 600lb capability. The 8" ring handles are twisted left and right to provide symmetry. A grand entrance to a pool, garden or back yard. Gates available in many styles and sizes. 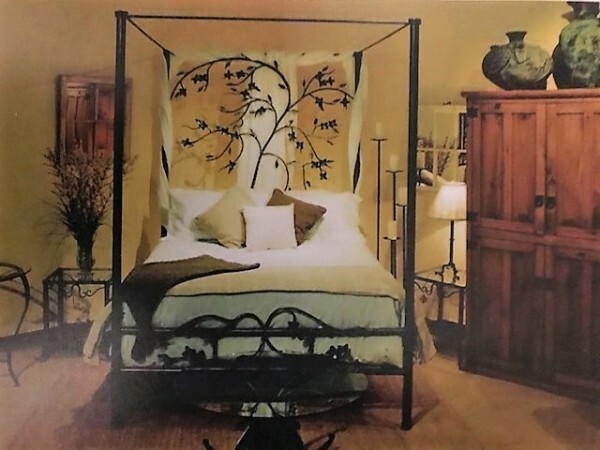 This custom built bed is an elegant statement in any bedroom. Beds available in many styles. 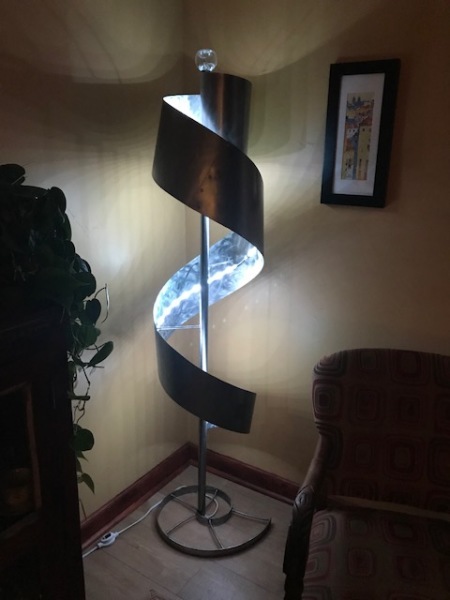 A stylish post-modern lamp with LED tape lighting that has 17 colors and 4 mood settings all on a remote control. Hours of fun! A lightweight rose for your favorite tweed jacket. It will definitely get noticed! This rack not only looks good, but holds a lot of wood for those cold winter nights. 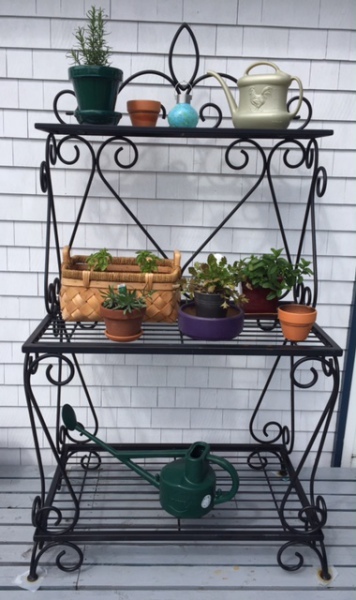 Wood racks available in many styles and sizes. 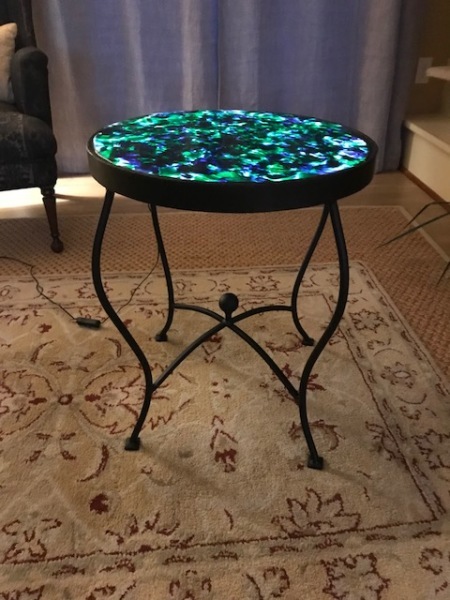 This occasional table with a French leg and finial ball has a lighted LED top to accentuate the gorgeous fused glass top. 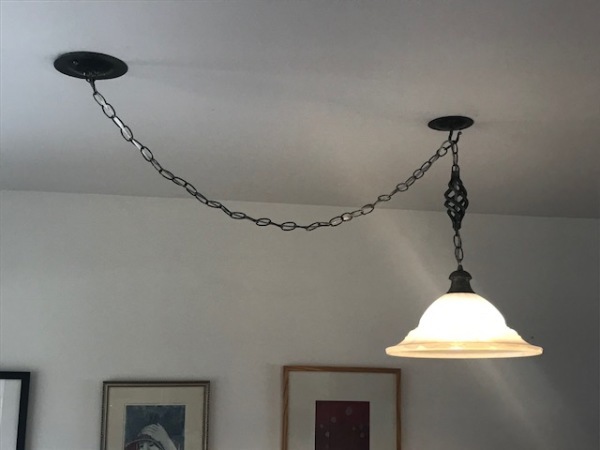 Take one antique lampshade and add some hand-forged iron to get one cool swag light. 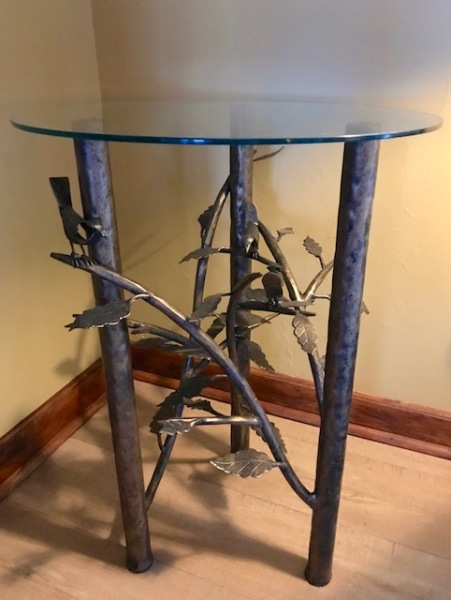 This 10' harvest table features repousse dragonflies on each end and a rustic wood top. Dining tables available in many sizes and styles. Traditionally hammered bars offset the fully rolled end, topped with a faux finish antiqued cap rail. 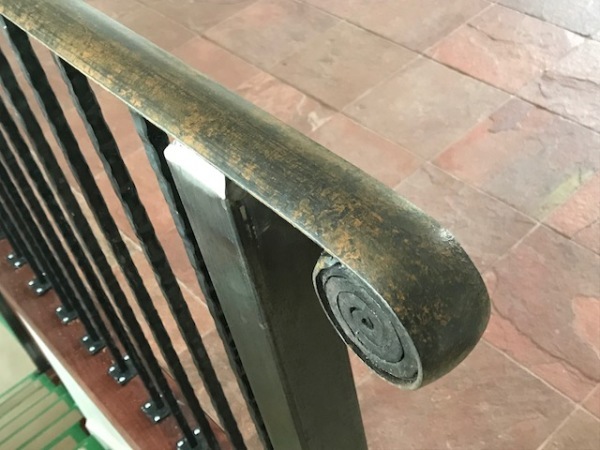 This modern stair rail features a raw oversize post and a fully rolled end in a faux rust finish.